Chelsea striker Alvaro Morata has placed blame on a back injury for ruining his first season in the Premier League. The Spaniard was signed in the summer from Real Madrid for a club-record £70million, but has failed to live up to expectations with just 14 goals from 40 appearances this season. 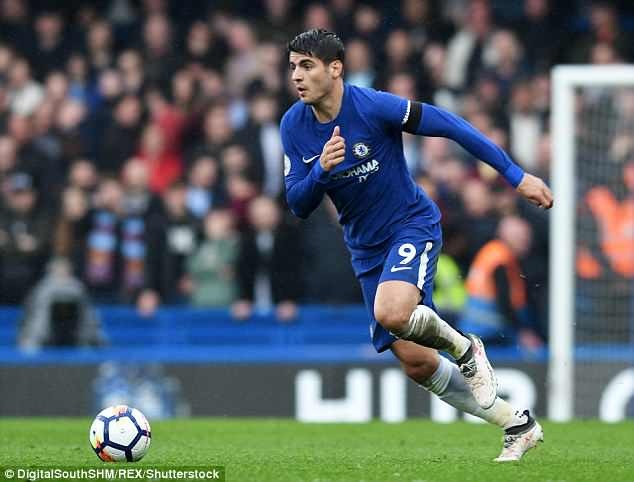 Morata looked to have made a seamless transition to English football, having scored seven times in his first eight games, but after suffering a back injury in December has found the back of the net on just two occasions since. Despite carrying the injury, Morata continued to play through the pain barrier and now admits it was a mistake on his behalf. It is understood he went to see a specialist in Germany earlier this year to help cure the problem. But the striker, who scored in Chelsea’s 3-1 defeat by Tottenham on Easter Sunday, feels he should have taken a break to make a quicker recovery. ‘Everything was good until I had the problems with my back,’ he said. ‘I played with a lot of pain and it probably would have been better if I’d stopped. ‘But I wanted to play with my team-mates, for the club and the fans. Now it’s in the past. Winning that trophy will now be their priority with the reigning champions languishing in fifth place in the Premier League and a Champions League qualification spot almost out of question. Southampton stand in the way of Chelsea progressing to the FA Cup final where they will play either Manchester United or Tottenham if they can beat the Premier League strugglers.